Instead of just needlepointing a normal photo, this week I was thinking that it could be fun to add a theme around an image on a custom needlepoint kit. St. Patrick’s Day is a great opportunity! 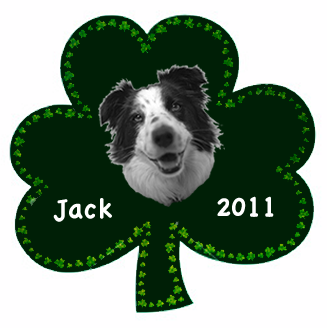 I was thinking a clover with your dog in the middle would look pretty cool! It took me a little while to find what I wanted, but as I’m learning to edit photos better, I found that taking the face works pretty well. Below, we have just 10 colors on a 12” square canvas. I did 18 mesh in this case, to catch the details in the dogs eyes. Of course the ideas here are unlimited! Recently, I was came across some amazing stitching work done by Su Embroidery Studio. I found their work at Mary Corbet’s Needle ‘N Thread blog. If you have time, you need to see these images! This got me thinking about how many beautiful animal portrait needlepoint kits we’ve made at NeedlePaint.com and how thrilled the response has been by our customers. Normally, people will send in the best images of their pet, but I think that there is a lot more opportunity for people who are looking for other types of special projects. 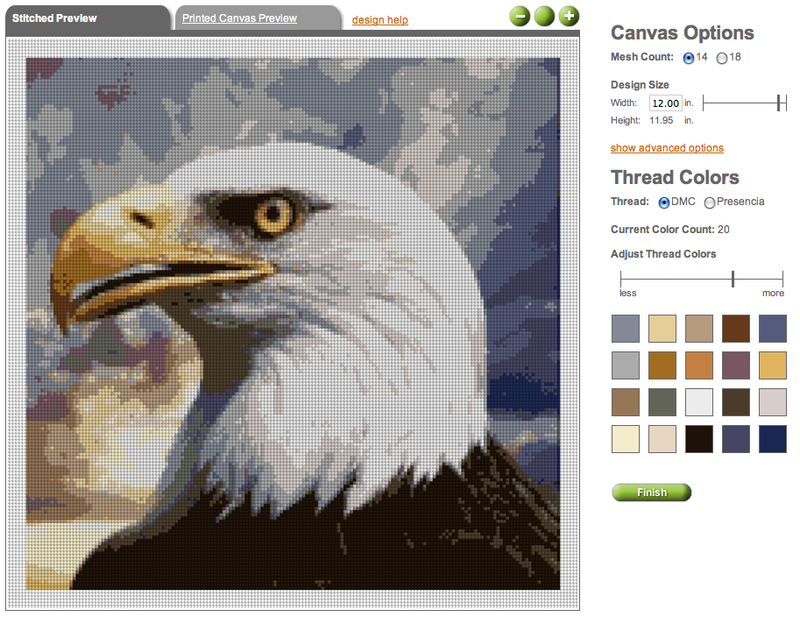 One of the great things about NeedlePaint.com, is that we are 100% custom, so if you can’t find great needlepoint kits of your favorite animals, you can have us make it for you! 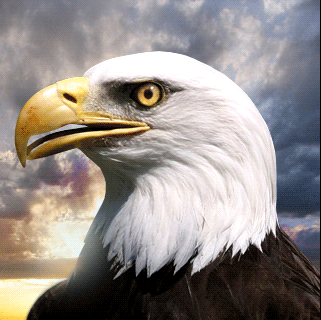 I’m using the bald eagle as an example. I searched and I could not find anything really good. You can see my search results below. 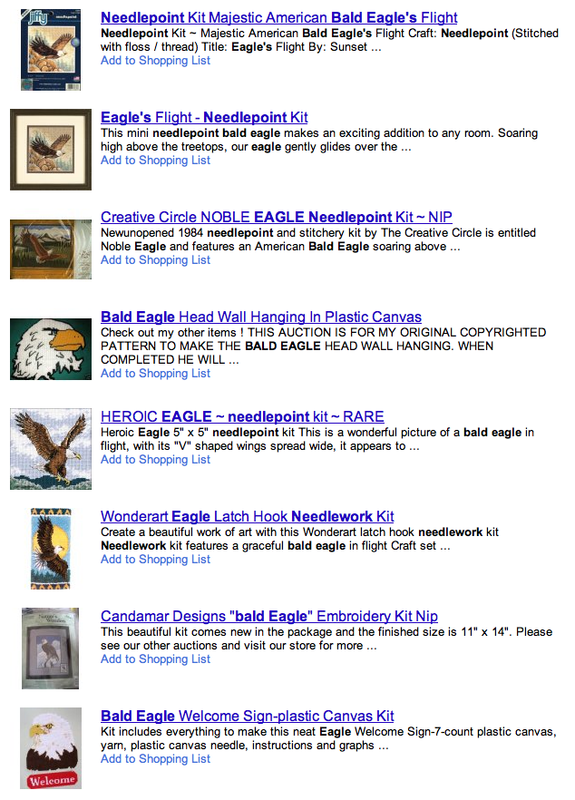 After that, I just looked for images of “bald eagle head”, and found thousand of spectacular images. Please be careful not to select a copyrighted image, if you cannot find a free image, then I recommend going to iStockPhoto.com There you can view thousands of animal photos that cost under $5. You can purchase the XSmall size. 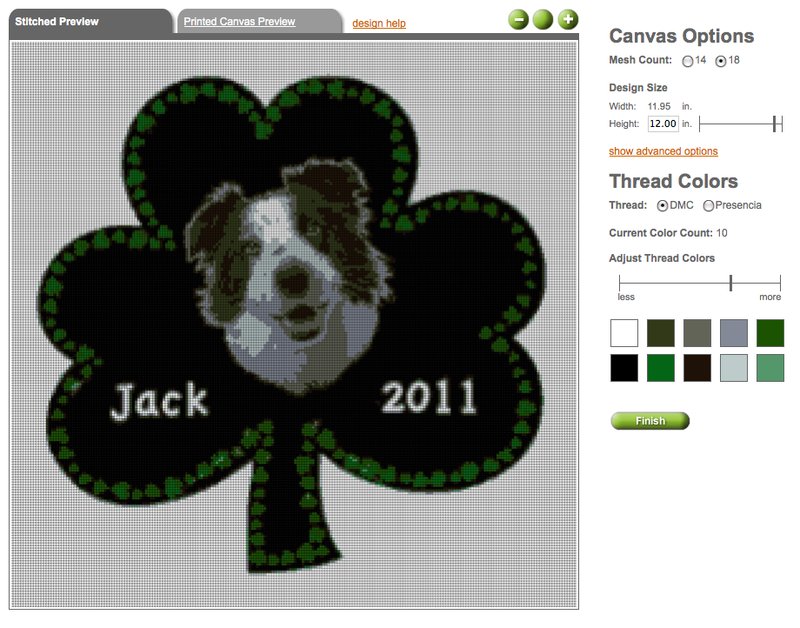 Next, I uploaded this picture onto NeedlePaint and look how great it looks! I can imagine thousands canvases for people who love ducks, cows, and all types of animals. Istockphoto really has a great selection of both farm and wild animals, just type in the name and enjoy! According to shopping reports, Christmas 2010 was the Christmas of the e-reader, and I was the recipient of one – a Barnes & Noble color Nook. 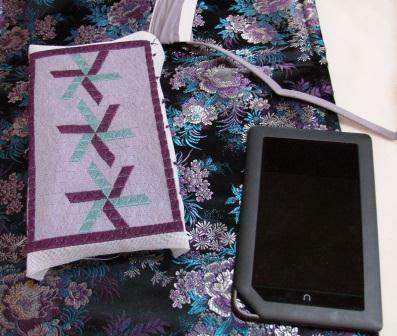 On Christmas day with e-reader in hand, I was not only excited about the present but itching to get started on a new project – a personalized needlepoint cover for my Nook. I blocked out a simple three-color pattern for 18-mesh canvas and decided to use a trianglepoint stitch made popular by Sherlee Lantz in her 1976 book Trianglepoint, because it covers the canvas quickly and I wanted to get the cover finished before I scratched the screen of my new Nook. The canvas was the same width of the e-reader and an inch longer. I planned the cover to be like a narrow box with a flap at the top which would fold over the top and fasten to the back with two snaps. I was in such a hurry to start that I forgot to photograph the canvas before I started. Sorry! The photo above shows the finished canvas with the piping, backing and gusset fabric, and white fleece for lining which I used. The fleece lining serves a dual purpose. It protects the screen from being scratched and it also cleans the screen as the Nook slides in and out (Figure 2). 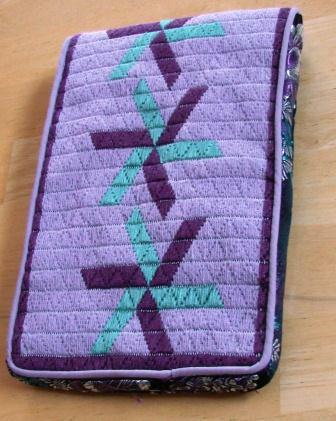 If I were to make this design again, I would extend the length of the needlepoint cover by another inch to have a longer flap. But mine is done now and I am a happy traveler with it.